Qipao Love: Part 27 ~ Wearing white to a Chinese wedding banquet? Happy New Year 2016 darlings! 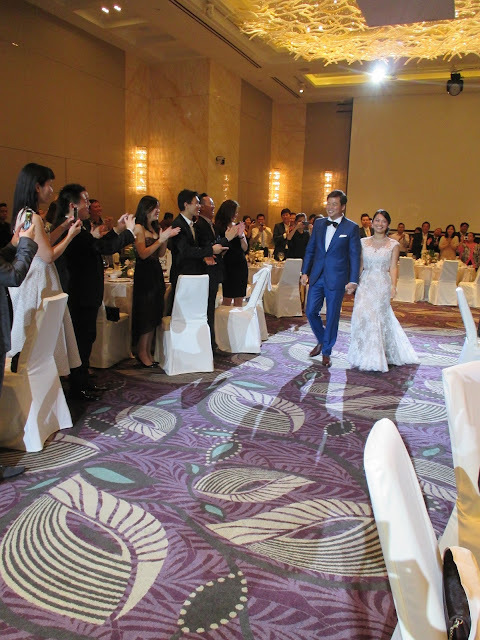 Welcome back to a continuation post on Chinese Weddings and the Qipao (Cheongsam) ....so if you are wondering whether it will be appropriate to wear white to a Chinese wedding, I hope this post will help. There has been quite a bit of spin within the media about cultural appropriation when it comes to ethnic clothing and needless to say it might be an issue of consideration when you are attending a cultural wedding. So here's what I wore to my sister's Chinese Wedding Banquet in Singapore; a custom made white and purple floral lace Qipao with a very high mandarin collar from Chinese Clothing Online, matched with a purple velvet kimono from New Look (both garments have been jacked up and actually hand finished by me!) But the secret to how I ended up wearing white was due to wardrobe malfunctioning....as the other green chiffon Qipao I got custom made by the same shop (Chinese Clothing Online) turned out very different from the design I chose and needed more fixing than I had time to finish so close to the wedding. 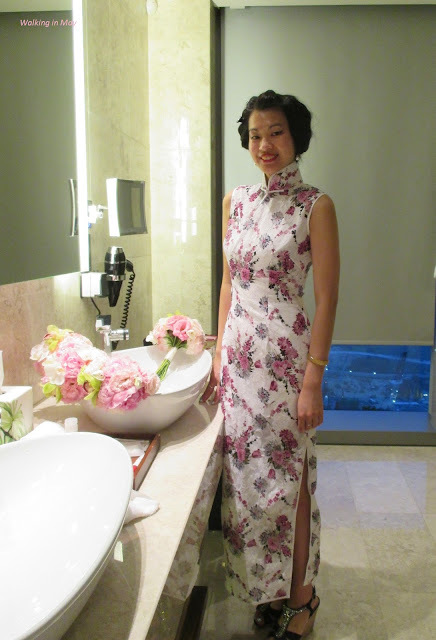 Why NOT wear white to a Chinese wedding? Traditionally WHITE is worn as a colour of mourning and mostly used at funerals in the Chinese cultural rites, but with Western popularity of the white bridal gown....modern Chinese brides will often opt to wear a fashionable white wedding dress and want to feel like the ideal bride of their dreams. Even in Western weddings some guests may consider the feelings of the bride in avoiding the colour white, as normal perception sees white being reserved for the bride. 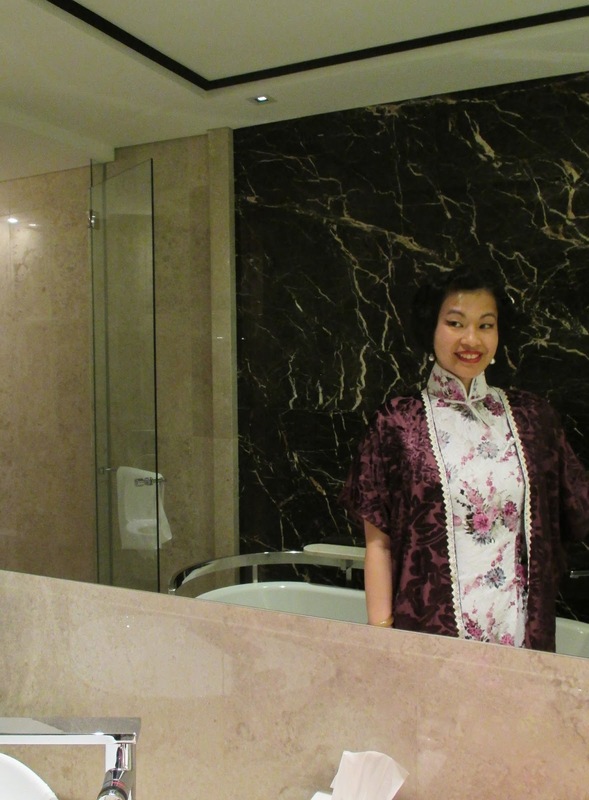 My sister being an exception in openly declaring that she did not mind if any of her guests chose to wear white and suggested I wear this white purple floral Qipao instead, I was still rather careful in keeping the purple kimono on. The other colour I would recommend guests not to wear to a traditional Chinese wedding would be RED....eventhough it is the official colour of celebration, happiness and good luck in Chinese culture, it is also traditionally the main colour reserved for the bride who should have all the great blessings of her special day. In older times of men having more than one wife, only the main wife who is granted status will be able to wear red on her wedding day and enter the home of her husband through the main door during the wedding procession. Whilst concubines were not allowed to wear red, entered through side gates and opted for lighter shades of pink or peach for their wedding dress instead. Another reason is that the venue or bridal home will probably be decorated in red too....in order to invite happiness into the couple's or family's home on such a happy occasion, so it may be a case of clashing with a red colour scheme. Of course this might not apply if the bride is not traditional at all or not intending to wear red, but if in doubt one can always choose other shades of reddish tones such as purple, lilac, browns, pinks, oranges, peaches or even other happy shades! 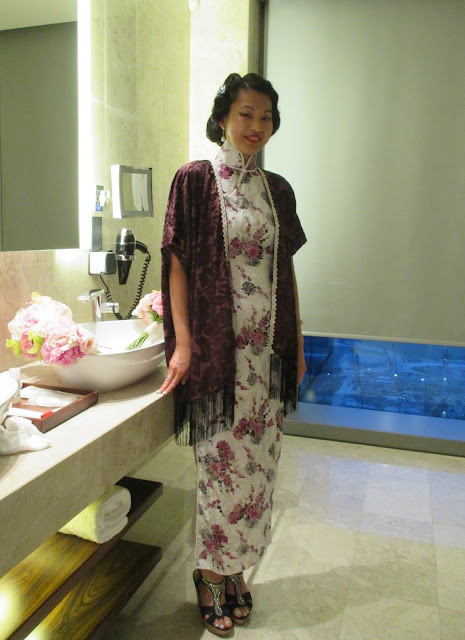 Hence with my trusted needle two weeks before the wedding, I took in the seams of this overly big custom made white and purple floral Qipao....then sewed on a white lace hem by hand to the velvet fringed purple kimono I found off a high street store to match it in my 1930s Golden Shanghai style. 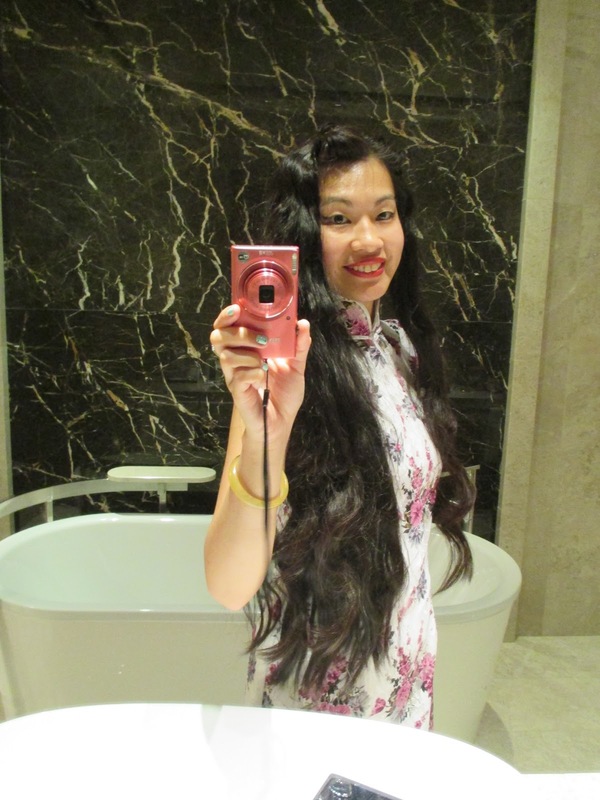 [Catch up on how the Qipao is usually worn to Chinese weddings, traditional Chinese Tea Ceremony and Chinese Bridal Kwa in the 'What to wear to a Chinese Tea Wedding Ceremony' post] With finger waves cold set the night before, I was ready to attend my sister's Chinese wedding banquet...and it was a lovely banquet indeed at Singapore's Westin. 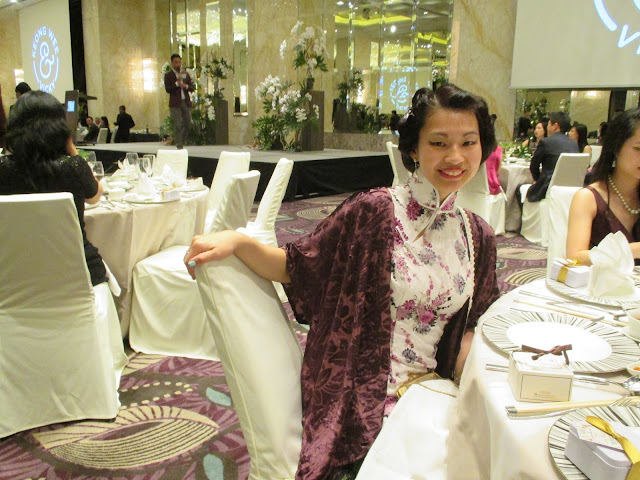 Next up will be my top pick of lovely Cheongsam (Qipao) designs for this coming Chinese New Year! Can you do a hair tutorial? You're hair is so long and luscious, yet you're able to finger-wave it into a neat little bob.